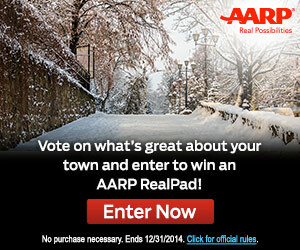 Hurry and enter the You and Your Town Contest on AARP.org here for your chance to win a free RealPad tablet. Only one tablet will be given away everyday during the contest. You only have until December 31st to enter the contest. AARP allows only 3,000 entries a day. So, if the contest fills up one day, just apply first thing in the morning the following day. You must be at least 45 years of age or older to enter. Residents of Florida are not eligible. This contest is only eligible to residents of Cincinnati, OH; Greater Manchester, NH; Long Island, NY; Los Angeles, CA; Phoenix, AZ; San Antonio, TX; Sioux Falls, SD; St. Louis, MO; and Seattle, WA. Each entry requires that you write an essay answering the question “Why is your town a great place to live?” along with an optional photo. AARP will post the finalists in an online gallery for public voting on their website. AARP invites individuals who enter the sweepstakes to vote for their favorite You and Your Town Submission.